I saw these tractors on Craigs List and just had to post an encouraging note to my friends who visit this website and who are moving or planing on moving their families out to the country. Here are three great little tractors for helping you with your garden work. These were available on Craigs List as of 2-7-2011 and all them are 4 wheel drive. 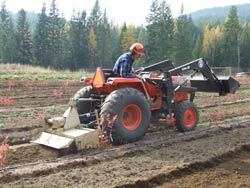 You could purchase one of these little tractors and find a tiller and a single bladed spade ("middle buster") that Big R. sells for about $179 and you would be set. I use the Big R.s middle buster all the time before tilling, it digs deep, and loosens up big rocks, making them easier to remove. 1. SOLD $2875 great looking tires see pictures. 2. SOLD $3100 obo, this might be the better deal. 3. http://spokane.craigslist.org/grd/2182567725.html $4500 this one comes with two extra implements worth about $600, which would make it $3900 compared to the two above. I like #2 the best because it has a nice canopy and a four way push blade, tires look good. I like #1 because the tires look great and the price is the lowest. I like #3 for the extra implements and the work he has done to get the exhaust out of your face. (A loader is a nice item to have as well, but it would better to have a tractor with a tiller and middle buster than no tractor at all, and you could add a loader later, or when you had the money saved up, you could buy a larger tractor with a loader, and sell the little tractor without the loader. Also it is best to find 4 Wheel Drive if you can. For some good advice read this: Proverbs 12:11 and 24:27.